In the United Kingdom hunting without qualification generally refers to hunting with hounds-normally fox hunting, beagling, stag (deer) hunting or minkhunting-whereas shooting is the shooting of game birds. What is called deer hunting elsewhere is deer stalking. As of 2012 game shooting and deer stalking are practised in the UK. Hunting with hounds in the traditional manner became illegal in 2002 in Scotland and 2005 in England and Wales, but continues on Northern Ireland. Following a trail (similar to drag hunting) rather than a live quarry subsequently grew in importance. The British Association for Shooting and Conservation (BASC) says that over a million people a year participate in shooting, including game shooting, clay shooting and target shooting. Hunting has been practised in Britain since prehistoric times; it was a crucial activity of hunter-gatherer societies before the domestication of animals and the dawn of agriculture. During the last ice age, humans and neanderthals hunted mammoths and woolly rhinoceroses by driving them over cliffs; evidence has been found at La Cotte de St Brelade on the island of Jersey. In Britain, hunting with hounds was popular in Celtic Britain before the Romans arrived, using the Agassaei breed. The Romans brought their Castorian and Fulpine hound breeds to England, along with importing the brown hare (the mountain hare is native) and fallow deer as quarry. Wild boar was also hunted. The earliest known attempt to specifically hunt a fox with hounds was in Norfolk, in the East of England, in 1534, where farmers began chasing down foxes with their dogs as a form of pest control. Packs of hounds were first trained specifically to hunt foxes in the late 17th century, with the oldest such fox hunt likely to be the Bilsdale in Yorkshire. By the end of the 17th century, many organised packs were hunting both hare and fox. Shotguns were improved during the 18th and 19th centuries and game shooting became more popular. To protect the pheasants for the shooters, gamekeepers culled vermin such as foxes, magpies and birds of prey almost to extirpation in popular areas, and landowners improved their coverts and other habitats for game. Game Laws were relaxed in 1831 which meant anyone could obtain a permit to take rabbits, hares and gamebirds. Hunting was formerly a royal sport, and to an extent shooting still is, with many Kings and Queens being involved in hunting and shooting, including King Edward VII, King George V (who on 18 December 1913 shot over a thousand pheasants out of a total bag of 3937), King George VI and the present day Prince Philip, although Queen Elizabeth II does not shoot. Shooting on the large estates of Scotland was particularly popular. This trend is generally attributed to the Victorians who were inspired by the romantic imagery of the Scottish Highlands. The shooting of game birds, in particular pheasant, is found in the UK, on large, traditional driven shoots on estates and on small-scale rough shoots. Shooting of game birds is carried out using a shotgun, most often 12 and 20 bore or a .410, often on land managed by a gamekeeper. Game birds are shot in different ways. In driven game shooting, where beaters are employed to walk through woods and over moors or fields, dependent on the quarry and time of year and drive game towards a line of 8–10 standing guns standing about 50 or 60 metres apart. The guns will be members of a syndicate sharing costs, or have paid in the region of £25+ per bird for pheasants and much more for grouse. The total bag (number of birds shot) will be anywhere between 10 and 400, again dependent on the budget and quarry. The day may be very formal, and the head gamekeeper or a shoot captain will oversee proceedings. Great emphasis is placed on safety. Pickers-up with dogs are also employed to make sure all shot or wounded game is collected. On such estates, large numbers of pheasants, partridge and duck, but not grouse, are reared and released to provide sufficient numbers of game. Grouse cannot be reared intensively but the heather moorland where they live is intensively managed to maximise numbers. Rough shooting, where several guns walk through a woodland, moor or field and shoot the birds their dogs put up, is increasingly popular. It is less formal and may be funded by several people grouping together to form a "syndicate", paying a certain amount each year towards pheasants, habitat maintenance, etc. 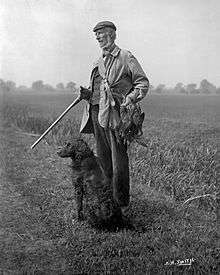 Wildfowling is often a lonely and uncomfortable sport. A single gun sits in pursuit of wildfowl by a body of water, or on the coastal foreshore, often at dawn or dusk, and waits for birds to "flight" in. This is sometimes undertaken in total darkness or by the light of the moon. Duck are also shot by the two methods described above. High-powered rifles are used for deer stalking. This may take place high on moors, or from a "high seat" in woodland. Venison is also a highly popular meat with sales quadrupling in the UK in 2014. Victorian era English dramatist W. S. Gilbert remarked, "Deer-stalking would be a very fine sport if only the deer had guns." The aforementioned species are those primarily pursued for game shooting. To this list can be added feral pigeon, jay, magpie, carrion crow, jackdaw, rook and collared dove, which are shot in the interests of vermin control rather than as game birds. Black grouse are no longer shot regularly, due to a continuing decline in numbers and those that are shot are most likely to be females mistaken for red grouse. Capercaillie are no longer shot in the UK, as they are now protected (Scotland only) due to a long-term decline in population. Eurasian coot and moorhen are also shot, but not as much as in the past; they have a closed season that follows the wildfowl season and are classed as game. Mean ± SE numbers of birds recorded in 4 ha plots in woodlands managed for pheasants compared with unmanaged woodlands in southern England. * indicates statistically significant difference. Created using data from Draycott et al. (2008). Habitat destruction and fragmentation are major drivers of biodiversity loss in the United Kingdom, however landowners that participate in field sports, particularly hunting and shooting, are more likely to conserve and reinstate woodlands and hedgerows because they are utilized by quarry species. A study in 2003 showed that they are around 2.5-times more likely to plant new woodlands than landowners without game or hunting interests, and also conserve a far greater woodland area. These habitats are essential for the persistence of a wide range of other British wildlife, and consequently it has been suggested that field sports can provide valuable tools for wildlife conservation in the UK, without the need for governmental subsidies or protective legislation. Landowners undertake management measures to improve habitats for quarry species, including shrub planting, coppicing and skylighting to encourage understory growth. Roger Draycott of the Game and Wildlife Conservation Trust has reported the conservation benefits of game management schemes in the UK, including woodlands that exhibit denser undergrowth and higher abundances of native birds. However, overall evidence that game shooting is beneficial to wider biodiversity has been inconclusive: high densities of game birds are known to negatively impact ecosystems, resulting in shorter grassland vegetation, lower floral diversity in semi-natural woodlands, fewer saplings in hedgerows leading from such woodlands, and possible reductions in arthropod biomass attributable to predation. The rearing of both wild and released game birds requires the provision of food and shelter during the winter months, and to achieve this landowners undertake planting of cover crops. Generally species such as maize or quinoa, these are planted in strips alongside arable land. Cover crops are also utilised by a variety of nationally declining farmland birds such as linnets and finches, providing valuable food resources and refuge from predators. One study assessed the response of bird assemblages to the implementation of a multi-dimensional game management system on a farm in Leicestershire, England. It was found that several declining species displayed significant population increases, suggesting that game management strategies may indeed play a major role in the conservation of wildlife in Britain, particularly threatened farmland passerines. Prior to the Hunting Act, fox hunting also provided a major incentive for woodland conservation and management throughout England and Wales, with higher species diversity and abundance of plants and butterflies found in woodlands managed for foxes according to a survey of mounted hunts in 2006, verified by The Council of Hunting Associations. The long-term ecological effects following the cessation of fox hunting and related management practices are still to be realised. A hunting lodge is a small country property specifically used for organising hunting parties. It can also be called a hunting box, shooting box or shooting lodge. Such places might be quite separate or detached from the main property, or in a different part of the country. 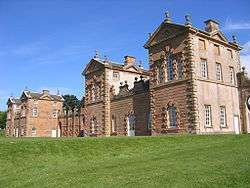 Chatelherault, built by William Adam in 1743 as the Duke of Hamilton's hunting lodge. The lodge may have a special room for hanging game and a gun room where guns were lodged and ammunition stored. Queen Elizabeth's Hunting Lodge, formerly known as The Great Standing, is located in Epping Forest. It is an example of such a Tudor installation. ↑ "BASC". BASC. Retrieved 2013-03-30. ↑ Aslam, Dilpazier (February 18, 2005). "Ten things you didn't know". The Guardian. London. ↑ "h2g2 - Common Pheasant and Relatives". BBC. Retrieved 2013-03-30. ↑ Ratcliffe, Roger (6 October 2006). "Blast from the past". The Yorkshire Post. Johnston Publishing Ltd. Retrieved 17 March 2015. ↑ Natural England. Lost life: England’s lost and threatened species. Worcester, England: Natural England; 2010. 1 2 Oldfield TEE, Smith RJ, Harrop SR, Leader-Williams N. Field sports and conservation in the United Kingdom. Nature 2003; 423: 531-533. ↑ Draycott RAH, Hoodless AN, Cooke M, Sage RB. The influence of pheasant releasing and associated management on farmland hedgerows and birds in England. European Journal of Wildlife Research 2012; 58: 227-234. ↑ Robertson PA. Woodland Management for Pheasants. Bulletin 106. UK: Forestry Commission; 1992. ↑ Sage R, Swan M. Woodland Conservation and Pheasants. Fordingbridge, UK: The Game Conservancy Trust; 2003. ↑ Ludolf IC, Robertson PA, Woodburn MIA. Changes in the ground flora and butterfly populations of woodlands managed to encourage pheasants. In: Buckey PJ (ed.) Biological Habitat Reconstruction. London: Belhaven Press; 1989. p312-327. ↑ Draycott RAH, Hoodless AN, Sage RB. Effects of pheasant management on vegetation and birds in lowland woodlands. Journal of Applied Ecology 2008; 45: 334-341. ↑ Callegari SE, Bonham E, Hoodless AN, Sage RB, Holloway GJ. Impact of game bird release on the Adonis blue butterfly Polyommatus bellargus (Lepidoptera Lycaenidae) on chalk grassland. European Journal of Wildlife Research 2014; 60: 781-787. ↑ Sage RB, Ludolf C, Robertston PA. The ground flora of ancient semi-natural woodlands in pheasant release pens on England. Biological Conservation 2005; 122: 243-252. 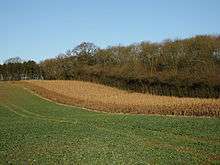 ↑ Sage RB, Woodburn MIA, Draycott RAH, Hoodless AN, Clarke S. The flora and structure of farmland hedges and hedgebanks near to pheasant release pens compared with other hedges. Biological Conservation 2009; 142: 1362-1369. ↑ Pressland CL. The impact of releasing pheasants for shooting on invertebrates in British woodlands. Ph.D. Thesis. Bristol: University of Bristol; 2009. 1 2 Parish DMB, Sotherton NW. Game crops as summer habitat for farmland songbirds in Scotland. Agriculture, Ecosystems and Environment 2004: 104: 429-438. ↑ Boatman ND, Stoate C, Watts PN. Practical management solutions for birds on lowland arable farmland 2000; In: Aebischer NJ, Evans AD, Grice PV, Vickery JA (eds.) Ecology and conservation of lowland farmland birds. Tring, UK: British Ornithologists’ Union; 2000. p43-54. ↑ Stoate C, Szczur J, Aebische NJ. Winter use of wild bird cover crops by passerines on farmland in northeast England: Declining farmland species were more abundant in these crops which can be matched to the birds' requirements. Bird Study 2003; 50(1): 15-21. ↑ Henderson IG, Vickery JA, Carter N. The use of winter bird crops by farmland birds in lowland England. Biological Conservation 2004; 118: 21-32. ↑ Sage RB, Parish DMB, Woodburn MIA, Thompson PGL. Songbirds using crops planted on farmland as cover for game birds. European Journal of Wildlife Research 2005; 51: 248-253. ↑ Stoate C. Multifunctional use of a natural resource on farmland: wild pheasant (Phasianus colchicus) management and the conservation of farmland passerines. Biodiversity and Conservation 2002; 11: 561-573. ↑ Ewald JA, Callegari SE, Kingdon NG, Graham NA. Fox-hunting in England and Wales: its contribution to the management of woodland and other habitats. Biodiversity and Conservation 2006; 15: 4309-4334. ↑ Lisa Gazeley (16 December 2010). "Queen Elizabeth's Hunting Lodge". City of London official website. City of London. Retrieved 31 May 2011. 1 Rarely shot due to declining numbers. 2 England and Wales only; protected Scotland. This article is issued from Wikipedia - version of the 9/19/2016. The text is available under the Creative Commons Attribution/Share Alike but additional terms may apply for the media files.